Community Giving Project - May 2018 Bonus! 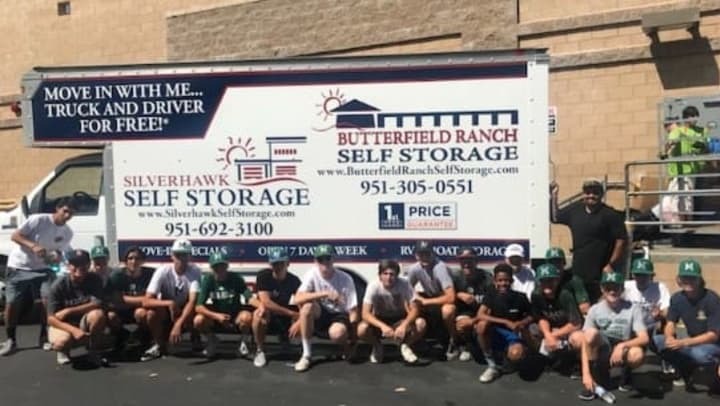 Butterfield Ranch Self Storage (BRSS) recently sponsored the Murrieta Mesa Rams Baseball program in their Savers fundraiser. BRSS donated storage space and the use of our moving truck to help the boys collect items for resale at the Saver Thrift Store in Murrieta. The team reported that they earned $1379.28 in their fundraiser. Congratulations! The photo above is of some of the high school players and coaches after a day of work in the hot sun. BRSS enjoys being a part of the Murrieta/Temecula community and loves to find unique ways to sponsor events and programs. We had so much fun!